In 2012, GMES was re-named Copernicus by the European Commission to honor the great European scientist and observer, Nicolaus Copernicus. Deployment of the Copernicus satellite constellation began in 2014 using different launch vehicles including the Soyuz and Vega rockets operated by Arianespace. 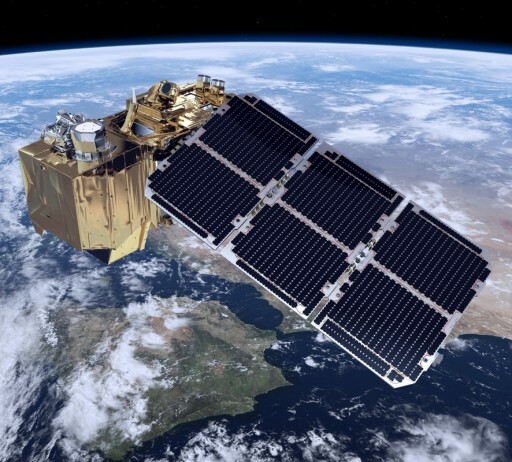 Sentinel-2 is an operational multispectral imaging mission within Europe’s Sentinel ‘Global Monitoring for Environment and Security’ Program, also known as Copernicus, operated by the European Commission and the European Space Agency for the collection of global land observation data at high-resolution and revisit capability. The Sentinel satellite fleet consists of different spacecraft outfitted with a range of payloads from optical imagers cover different wavelength ranges, radars, sounders and other sensors. Sentinel-2 will deliver data to support the operational generation of high-level data products such as land cover and land use detection maps, soil sealing maps, forest area maps, and maps of geophysical variations including leaf area index, leaf chlorophyll content and leaf water content for vegetation assessment. The mission will gather systematic land surface imagery including major islands to deliver cloud-free data products using two satellites to reach a 5-day revisit cycle. With Sentinel-2A becoming available some time before the second satellite is launched, the revisit time will be around ten days. Other programs such as Landsat-7 and SPOT can not provide systematic coverage of the global land mass with revisit times of 16 and 27 days respectively. The overall goal for the Sentinel-2 program is to have an operational capability in orbit for at least 15 years which calls for two satellites in orbit at any given time and a third on the ground as a backup. It is expected that four Sentinel-2 satellites will be launched. 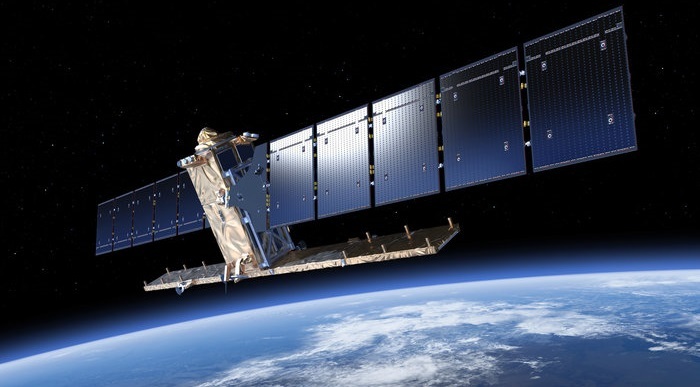 The European Space Agency awarded the contract for the development of the first Sentinel-2 satellite in April 2008 to EADS Astrium (now Airbus Defence and Space). Astrium Germany is responsible for the development and manufacture of the Sentinel-2A satellite platform and the satellite integration and testing program. The Toulouse Branch of Astrium is responsible for the MultiSpectral Instrument while Astrium Spain delivers the satellite structure already integrated with the thermal equipment. The contract for Sentinel-2B was awarded to Astrium in March 2010, calling for a satellite identical to the 2A spacecraft. The Sentinel-2 satellites are based on the AstroSat-L platform, a flexible small satellite bus capable of hosting a variety of payloads for an operational on-orbit life of ten years with a consumable-load suitable for different mission needs. 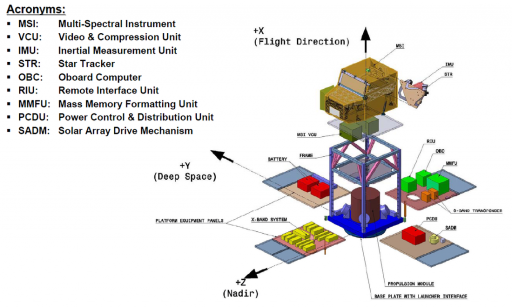 The overall satellite design is one-fault tolerant and equipped with a Failure Detection, Isolation and Recovery concept that is adapted to the specific needs of the mission. 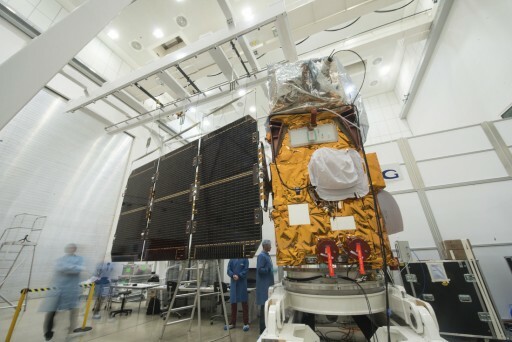 The Sentinel-2 satellite has a launch mass of approximately 1,140 Kilograms consisting of a box-shaped satellite platform with a standard payload adapter in the aft and the payload section in the forward segment of the satellite. 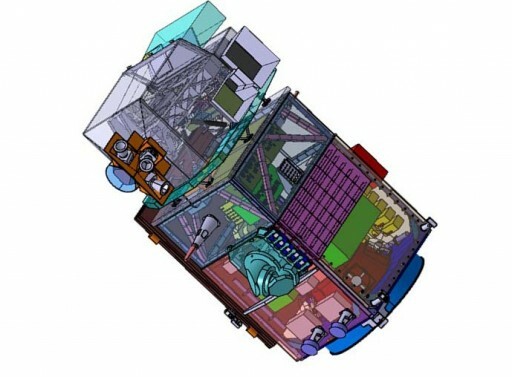 The spacecraft measures 3.4 by 1.8 by 2.35 meters in size consisting of a an aluminum frame making up the satellite body and providing mounting structures for the aluminum-core honeycomb panels that build the internal and external structure of the satellite, providing installation surfaces for the various satellite subsystems. Sentinel-2 is equipped with a single deployable solar array consisting of three panels for an active surface area of 7.1 square meters. The array delivers 2,300 Watts (BOL) of electrical power through the use of Gallium-Arsenide triple-junction solar cells, dropping to a power supply of 1,700 Watts at the end of the mission with a nominal power consumption by all satellite systems on the order of 1,400 Watts. A Solar Array Drive Mechanism including a two-phase stepper motor is used to articulate the solar array by +/-150 degrees for sun-tracking to ensure maximum power generation. 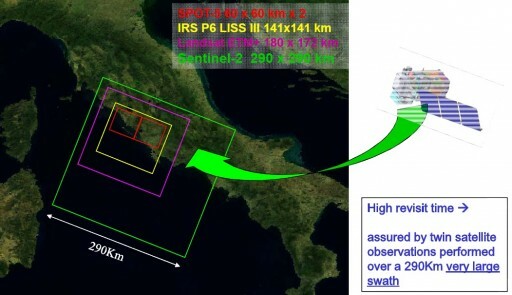 Sentinel-2 employs Maximum Power Point Tracking. A Power Control and Distribution Unit delivers power to the various satellite systems through a 28-Volt power bus with bus protection. 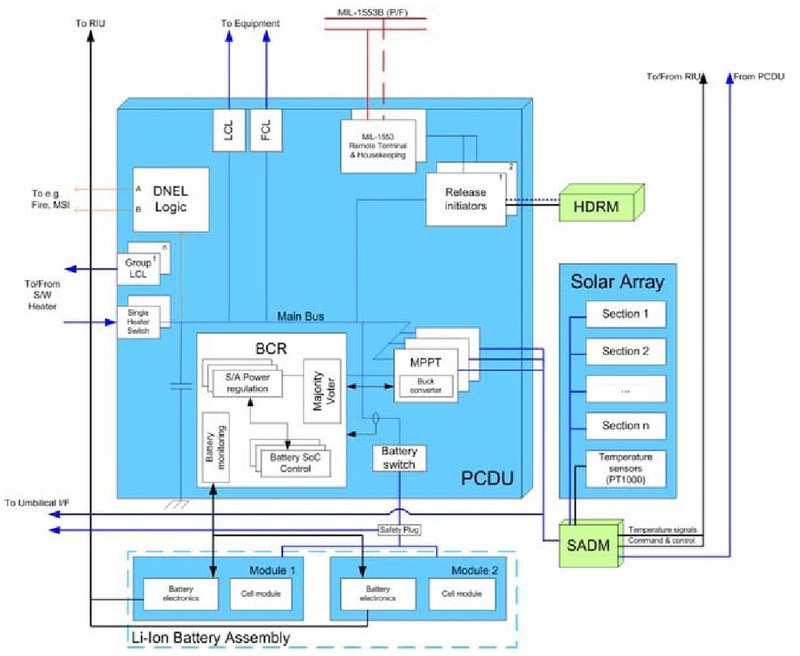 The PCDU also controls the Battery Control Unit that employs a majority-voting system for the control of the state of charge of an eight-cell 102 Amp-hour Li-Ion battery that delivers power to the various satellite systems during night passes. The thermal control system is comprised of passive and active systems featuring Multilayer Insulation on the various satellite subsystems plus heaters to maintain critical survival temperatures in the event of cold satellite environments. Furthermore, a series of heat pipes and Deep Space Radiators are used to radiate excess heat into space. To comply with the requirements for geo-locating acquired imagery. Sentinel-2 sports an accurate Attitude Determination and Control System. 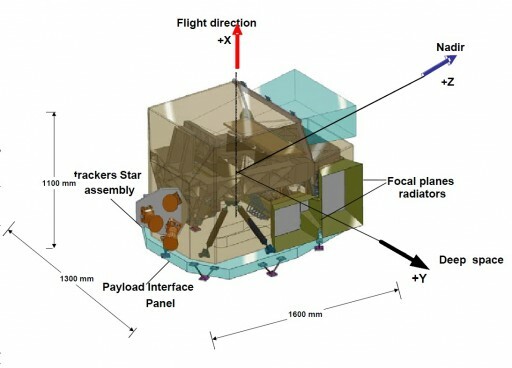 Sentinel-2 uses a Star Tracker system comprised of three optical heads connected to a single electronics unit. The Star Trackers use Active Pixel Sensor technology to acquire optical imagery of the star-filled sky that is put through an on-board algorithm which identifies bright stars and compares the patterns with a catalog of stars and constellations to be able to calculate the precise three-axis orientation of the satellite. This software algorithm is run within the Star Tracker system to deliver complete quarternions to the onboard computer. The Star Tracker heads are attached to the thermally controlled sensor plate to avoid misalignment as a result of thermal cycles. A Rate Measurement Unit is used for the determination of body rates during initial attitude acquisition to allow the Star Tracker and other sensors to acquire three-axis attitude data. It is also used for the acquisition of a precise yaw rate to ensure proper Earth pointing of the satellite. Additionally, an ASTRIX 200 Inertial Measurement Unit is installed on the satellite, using four independent angular ate detection axes featuring Fiber Optic Gyros to provide single-fault tolerance. The system weighs 12.7 Kilograms and consists of a sensor assembly and an electronics box allowing the thermally dissipative electronics box to be installed separate to the sensor unit that can be hosted on the thermally stable payload bench to minimize thermal effects on the measurement. The system can tolerate body rates up to 15°/s delivering measurements at a frequency of up to 100Hz at a high stability. Sentinel-2 also uses a three-axis Magnetometer to deliver data to the flight computer for the calculation of torque rod operation. Coarse Earth and Sun Sensors are used as backup attitude sensors to come into play in case of spacecraft safe modes to ensure proper Earth and Sun pointing depending on the safe mode type. The Attitude Control System consists of four Reaction Wheels and three Magnetic Torquers. The reaction wheel assembly is a rotating inertial mass that is driven by a brushless DC motor that spins the wheel. When accelerating the wheel, the satellite body to which the wheels are directly attached will rotate to the opposite direction as a result of the introduced counter torque. Three Magnetic Torque Rods with redundant coils are used to create angular momentum by running a current through coils in the presence of Earth’s magnetic field. The torquers are regulated by computers that control the current that is passing through the coils in order to control the force generated on each axis. The magnetic torquers are used during momentum dumps and for attitude control in spacecraft safe mode. Actuation of the torquers is commanded based on readings from a three-axis magnetometer. 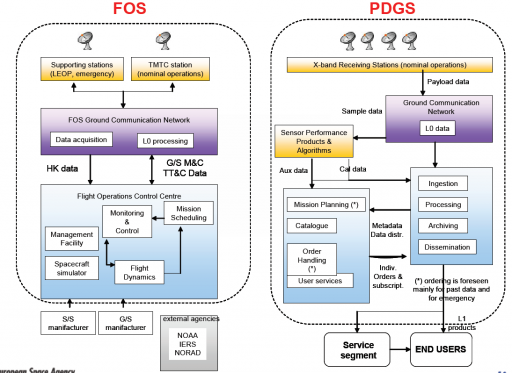 Two dual-channel GPS units are also part of the avionics system that use the L-Band frequency to receive signals from the GPS constellation for accurate position determination and to provide time solutions for data tagging with timing and location. Each sensor uses a patch excited cup antenna with optimized multi-path performance measuring 200mm in diameter and 87mm in height. The antenna is attached to a 2.8 Kilogram electronics box (300x240x104mm). The Sentinel-2 spacecraft is outfitted with a propulsion system consisting of eight thrusters fed from a central hydrazine tank. The tank is located in the aft of the satellite, housed in a cylindrical extension of the payload adapter that provides structural support to the tank assembly. 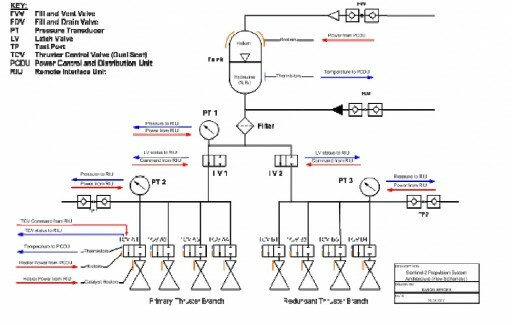 Two banks of four thrusters are installed on the satellite to provide assistance with attitude control when required, but their primary role will be in-plane and out-of-plane orbit adjustment maneuvers. The thrusters operate through the generation of high-pressure gas as hydrazine monopropellant decomposes when running over a heated metal catalyst bed. Each thruster delivers 0.3 to 1 Newton of thrust depending on the inlet pressure that can range from 5.5 to 22 bar. The thruster weighs 290 grams and operates at a nominal mass flow of 0.44g/s and an impulse range of 200 to 223 seconds. It is capable of operating in pulse and steady state modes with a cycle life of 59,000. Sentinel-2 carries 120 Kilograms of propellant that will support a mission duration of up to 12 years. The spacecraft uses an ERC32 PM processor as the heart of its Data Handling System, controlling all aspects of the functions of the satellite – handling systems telemetry, operating the fault protection system, executing commands, handling communications (up and downlink), receiving and storing payload data and operating the satellite payload. Sentinel-2 uses 1553 and RS-422 data buses for the internal transfer of data between the various satellite systems. Payload Data is put through an onboard compression algorithm in most of the science modes, being compressed from a raw data rate of 1.3Gbit/s to around 450Mbit/s for storage in a 2.4Tbit onboard mass memory ahead of downlink to the ground. 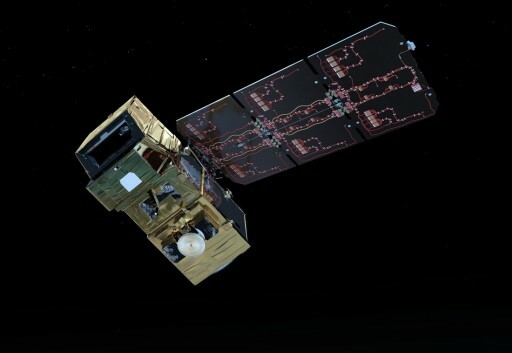 Sentinel-2 is the first mission to fly the Astrium Mass Memory and Formatting Unit that employs NAND-Flash Technology (NAND – Not And in Boolean logic). Developed by Astrium and the University of Braunschweig, this system introduces NAND technology for operational application in space missions, particular those with very high data volume and integrity requirements. The system used on Sentinel-2 consists of 11 memory modules and has a total mass of 14 Kilograms, measuring 30 by 35 by 24 centimeters in size, hosting 2800 Gbits of memory at the beginning of its mission and is expected to safely degrade to 2400Gbit over the course of a 12.5-year mission. The MMFU receives two parallel data streams, each up to 540Mbit/s, from the Video Compression Units of the Multispectral Imager Instrument. 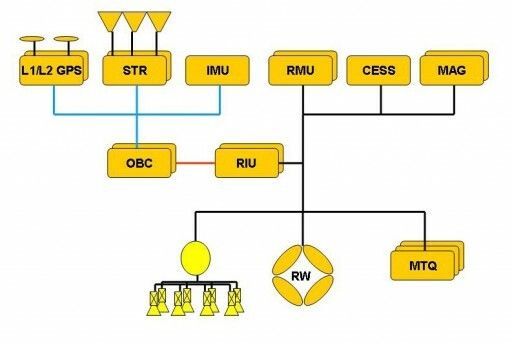 The VCU interfaces are cross strapped with redundant Payload Data Interface Controllers that adapt the data to the internal MMFU data format for storage in memory modules. 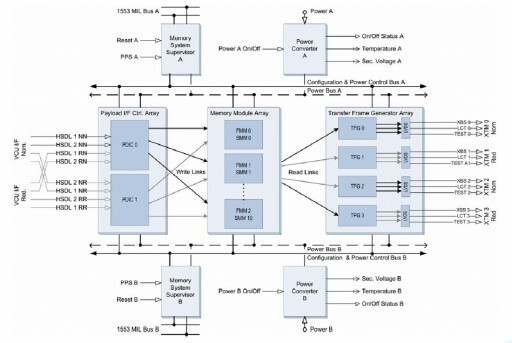 The Flash Memory Modules, 11 in total, each consist of a 32Gbit Flash device that itself is comprised of four 8Gbit dies which means that the entire Flash Memory Module hosts 76 devices in four partitions that can be individually powered. Each partition includes 16 devices for data storage and three devices to hold partition data for error correction. The system can be modified based on mission needs, varying in the number of installed Flash Memory Devices. The Flash Memory is non-volatile – data retention is guaranteed in the event of a power loss. Also, the system supports parallel write & read functions. 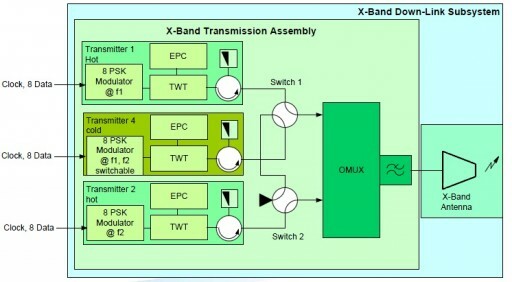 Read-out from two parallel operated memory modules is accomplished by two of four Transfer Frame Generators that deliver data for downlink with two parallel 280Mbit/s streams. The entire system is controlled by Memory System Supervisor using an ECR32 processing device with operational voltages supplied by a redundant power converter. Payload data is downlinked from Sentinel-2 using a high-speed X-Band terminal that achieves data rates up to 560Mbit/s using an isoflux antenna. The antenna’s isoflux zone is +/-64 degrees to allow a link establishment with ground stations starting at a ground antenna elevation of 5 degrees to maximize pass length and data volume. Telemetry Downlink and Command Uplink is accomplished through S-Band using a helix and a patch antenna to reach a nominal uplink data rate of 64kbit/s and a downlink at 1Mbit/s. In addition to its radio communications system, Sentinel-2 carries a Laser Communications Terminal to use the European Data Relay System EDRS that consists of laser terminals deployed in Geostationary Orbit aboard Communications Satellites. The LEO-GEO communications link can achieve high data rates and the Geostationary Satellite will use a Ka-Band link to a ground station to relay the data to the ground. The Laser Communications Terminal consists of a 2.2-Watt laser and a telescope with a 135-millimeter aperture to be able to transmit information over a distance of more than 45,000 Kilometers. 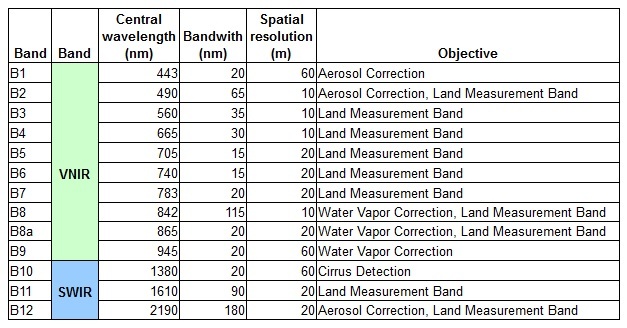 The single instrument of the Sentinel-2 satellite is the Multispectral Imager MSI that covers 13 spectral bands using a pushbroom sensor with a Three Mirror Anastigmat optical design. The Three Mirror Anastigmatic design was chosen since it provides a larger field of view than the conventional Cassegrain or Ritchey-Chrétien systems. Overall, the instrument has a mass of 275 Kilograms and requires 266 Watts of electrical power. The telescope has a pupil diameter of 150 millimeters and a 20.6-degree field of view to create a ground swath width of 290 Kilometers. The structure of the optical payload and the mirrors are fabricated of Silicon Carbide given its favorable thermal characteristics. Two focal plane assemblies are used to facilitate the instrument’s spectral range of 0.4 to 2.4 micrometers, covering the visible, near infrared and shortwave infrared bands. 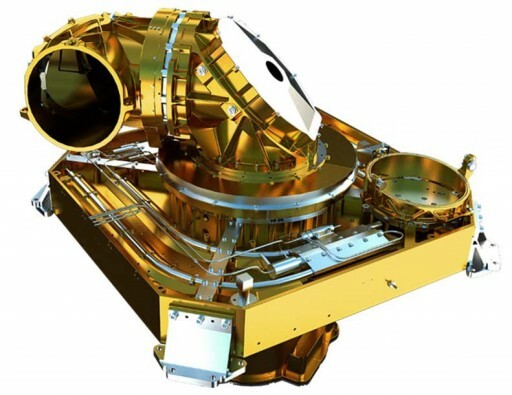 The mechanical structure of the MSI instrument facilitates the three mirrors, two focal plane assemblies, beam splitter and star tracker optical heads. The overall structure measures 1.47 by 0.93 by 0.62 meters in size and weighs about 44 Kilograms. It is attached to the satellite platform by three bolted bipods that thermally decouple the payload structure from the spacecraft. Light entering the telescope aperture is separated by a dichroic filter to enter different paths towards the two focal planes of the instrument, first passing on the primary mirror that reflects it to the secondary and tertiary mirrors that focus the light onto the Focal Plane Assemblies and create the required focal length. The mirrors are made of Silicon Carbide that provides excellent characteristics – high stiffness and extremely low thermal expansion. All telescope components are installed on a stable optical bench with favorable thermal characteristics. The M2 mirror consists of a conic surface while the other two mirrors need more aspherization – the primary mirror of the instrument is 44.2 by 19.0 centimeters in size and weighs 2.3 Kilograms while the M2 mirror is 14.7 by 11.8cm with a mass of 300 grams and the M3 mirror is 55.6 by 29.1 centimeters in size and weighs 5.1 Kilograms. The primary and secondary mirrors are held in place by central flexures installed on their backside while the tertiary mirror uses bipods that are glued to the outer mirror edges. Spectral filtering is accomplished by slit filters that are installed atop the detectors to ensure the required spectral isolation is achieved. The instrument hosts a total of 29 000 active pixels within the two focal plane assemblies. The Visible and Near Infrared focal plane features a monolithic CMOS detector (Complementary Metal Oxide Semiconductor) and the Short Wave Infrared side uses a Mercury Cadmium Telluride detector hybridized on CMOS read-out circuitry. Each Focal Plane Assembly consists of 12 elementary detectors that are arranged in two staggered rows to achieve the desired swath width. 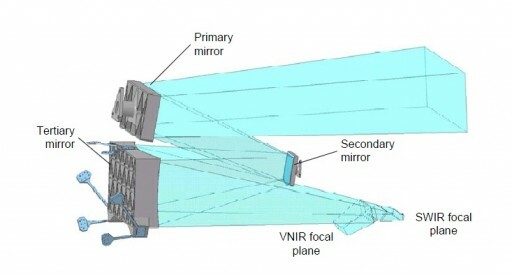 Passive cooling is employed to keep the VNIR focal plane at its operational temperature of 20°C and the SWIR side below –80°C to reduce dark currents. 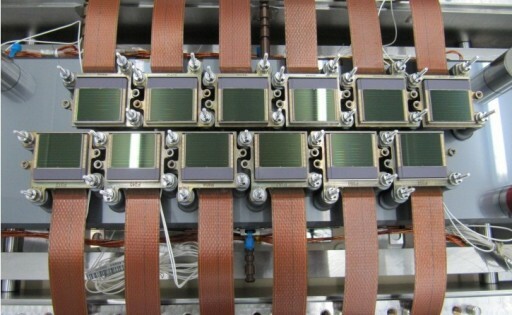 The detectors are supported by a Silicon Carbide structure holding the detectors and filters, also providing a direct thermal link to the radiators of the detector units. 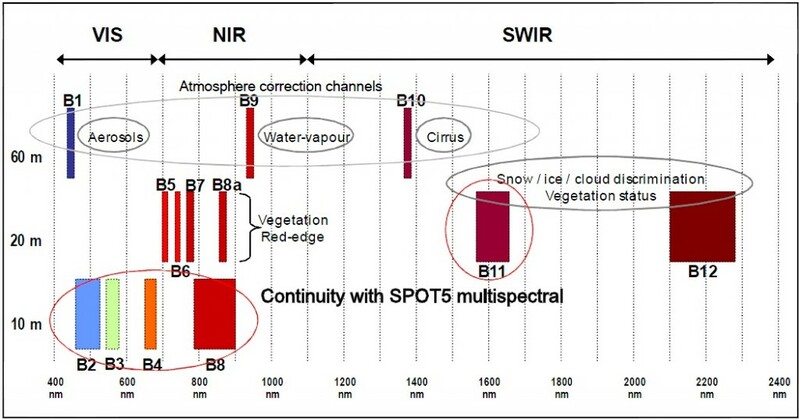 The spectral filters include different sections with different passband properties to facilitate the required spectral channels of the instrument – ten in the VNIR spectral range from 443 to 945 nanometers and three in the SWIR band from 1375 to 2190nm, meaning that each detector section is provided with a different spectral band, imaging the ground as it passes by. The channels covered by the instrument achieve spatial sampling distances of 10, 20 and 60 meters and also have different spectral widths. Eight channels are used for land measurement and seven are used as calibration bands. The ten-meter sample distance channels are operated in Time-Delay Integration mode and so are two of the three SWIR channels. 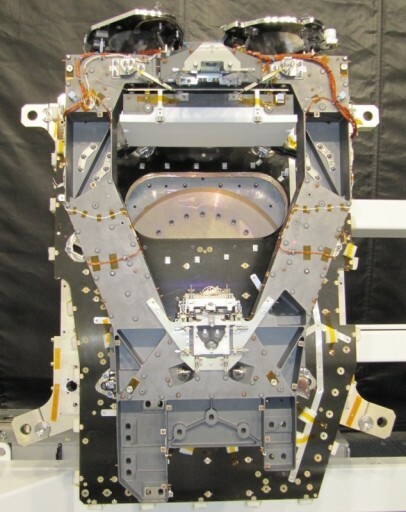 The MSI instrument uses a Calibration and Shutter Mechanism in the form of a large rectangular plate that can be moved in front of the instrument entrance to protect the instrument during launch and when in danger of becoming exposed to direct sun light. Also, the mechanism allows an intermediate position to place a sun diffuser in the optical path for calibration purposes. 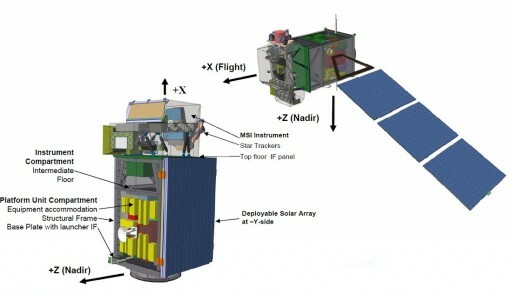 The Sentinel-2 satellites are planned to operate from a Sun Synchronous Orbit at an altitude of 786 Kilometers and an inclination of 98.5 degrees for 14.3 revolutions per day and a 10:30 Local Time of Descending Node that has been chosen to minimize cloud cover and ensure a good solar illumination of Earth’s surface. 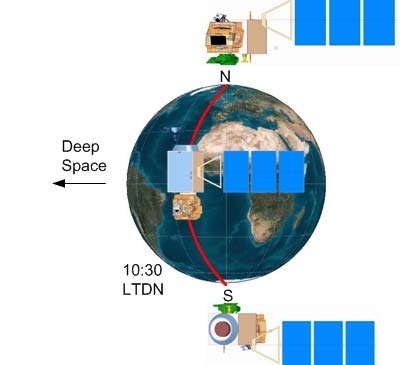 The LTDN has also been set up to allow a seamless combination of data from the SPOT and Landsat Programs that have similar orbital setups so that historical data from legacy missions can be used with Sentinel-2 data in the collection of long-term temporal image series. The two operational Sentinel-2 satellites will be spaced by a 180-degree phasing to cut the revisit time of a single satellite in half. The Sentinel spacecraft will acquire land and coastal area imagery from 56° South latitude to 84° North including all major land masses and islands greater than 100 square Kilometers. All islands less than 20km from the coast line will be covered as will the entire Mediterranean Sea, all inland water bodies and closed seas. Additional observations of calibration sites will be planned by the mission team. Sentinel 1 and 2 are controlled through the European Space Operations Center (ESA) while the Sentinel-3/4/5 satellites or hosted payloads are operated by EUMETSAT. Four X-Band receiving stations have been established in Norway, Alaska, Spain and Italy. The Sentinel-2 Processing and Archiving Center are operated by the German Aerospace Center in Oberpfaffenhofen and Astrium (Airbus D&S) in Farnborough, UK. The Mission Performance Center is located in Brest, France, the Payload Data Management Center operated by ESA is located at ESRIN and the Precise Orbit Determination service is provided by GMV, Spain. Sentinel-2 has been conceptualized for long stretches of autonomous operations, being capable of running on one command uplink for 15 days in a nominal mission scenario and remaining operational for 72 hours without intervention in the event of an onboard failure.